RJD, JD-U cross swords; First crack in coalition? 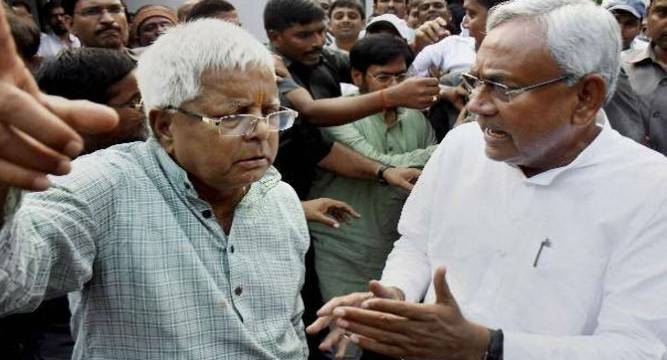 Close on the heels of RJD chief Lalu Prasad’s apparent snub to Bihar Chief Minister Nitish Kumar over deterioration in the law and order situation, senior party leader Raghubansh Prasad Singh expressed concern over the rise in crime and asked Kumar to check the slide. “Sensational murders of engineers in Bihar recently have proved that law and order is not good in the state,” Singh told. “Even a child can give advice,” he said apparently reacting to Singh’s views. “Law and order has always been the USP of Nitish Kumar for which he has won praise across the country. Some criminal incidents have taken place to which the CM is looking into and will handle it,” Bihar Education Minister Ashok Choudhary, who is also state Congress chief, told PTI.